Following recent product launches by technology giants Samsung, Googlerola and Microkia, the online retail giant Amazon summoned select members of the press to a media event in Los Angeles, California. As previously hinted, the company is expected to unveil half a dozen new Kindle devices, including a ten-inch tablet to take Apple’s iPad head on. Note: all images in this post are credited to The Verge. 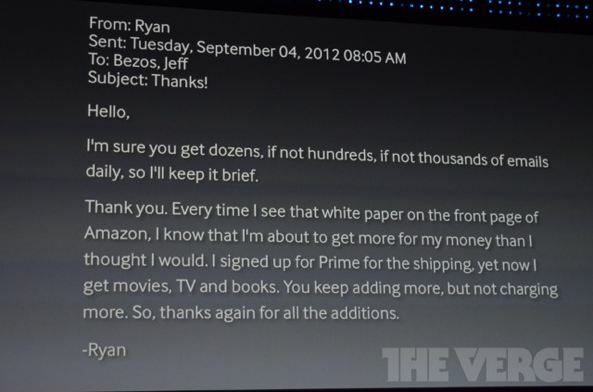 Amazon CEO Jeff Bezos took to stage to kick off the main event with an email from a customer, in a true Steve Jobs fashion. He then put up a slide with a customer notice. We get a number of emails like this when we add to Prime or when we do something for customers. We love it. We live for email like this. Customers are smart. Last year, there were more than two dozen Android tablets launched into the marketplace, and nobody bought ’em. Because they’re gadgets, and people don’t want gadgets anymore. They want services that improve over time. They want services that improve every day, every week, and every month. That’s an interesting assumption that Apple nailed a long time ago – it’s not about the ecosystems, stupid. 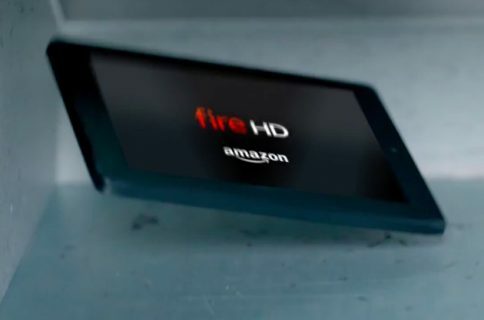 Kindle Fire is not a tablet, he said, it’s a service, one that includes 180,000 Kindle-exclusive books, the Kindle lending library (no due dates or waiting list), 25,000 movies and television shows in the Prime Instant Video service and more. He then put up the following graph. 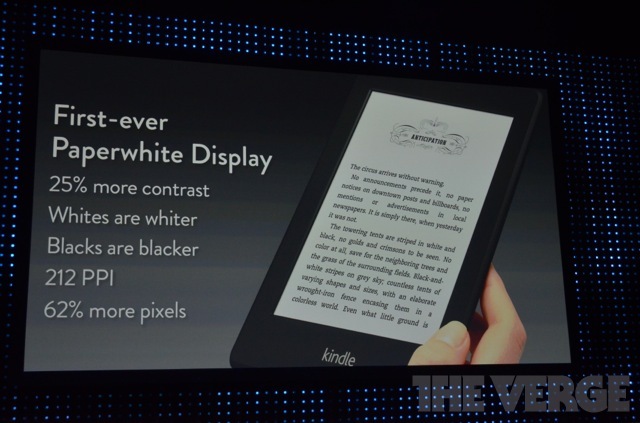 Bezos then took the wraps off the Kindle Paperwhite, a next-generation Kindle e-reader with a brand new display technology. 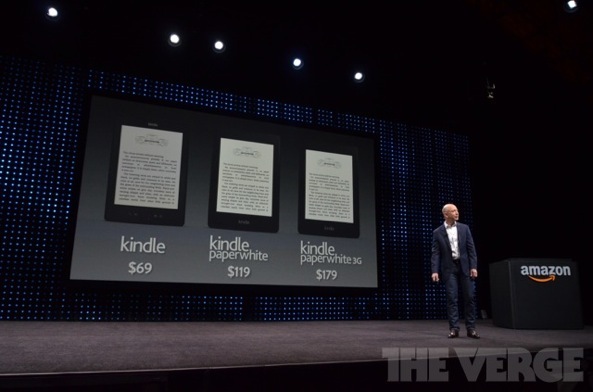 The Paperwhite Display didn’t exist before, so Amazon had to create one, Bezos quipped. 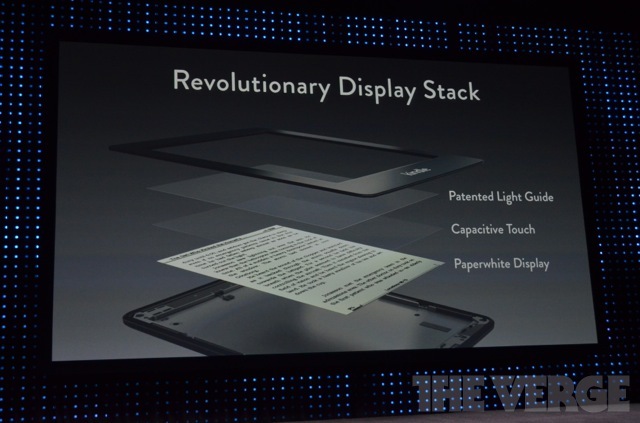 The display packs in some pretty impressive technologies. “This is exactly what Star Trek told me would happen”, Amazon’s boss joked. The high-resolution display has 62 percent more pixels, with pixel density at a cool 212 pixels-per-inch. 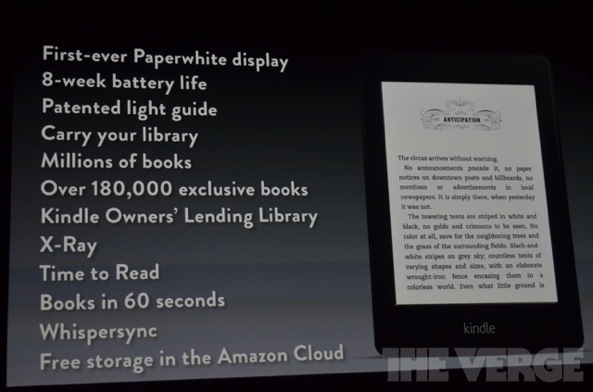 It’s also battery-friendly so the new Kindle Paperwhite gets a whopping eight weeks (yes, weeks!) of battery life even with the light on. Palatino typeface apparently looks pretty sharp on this innovative new display. The device itself is 9.1mm thick (“it’s thinner than a magazine, lighter than a paperback”) and weighs in at 7.5 ounces, or just 212 grams. You can also put it in cover mode, like the Kindle Fire, letting you swipe through, look at all your on-device content or switch to the cloud view. It also shows you how much time is left in your chapter or the entire book. Just $119 for the WiFi-only version ($179 for the Kindle Paperwhite 3G). You can pre-order it today (ships October 1). Here’s a laundry list of features. The entry-level $79 Kindle has been slashed by ten bucks, now costing just $69 and shipping September 14. Of note, this new entry-level Kindle comes with new fonts, crisper text and faster page turns. 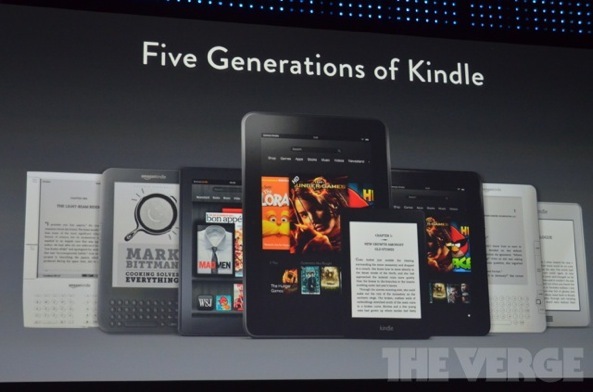 And here’s the new Kindle e-reader lineup. 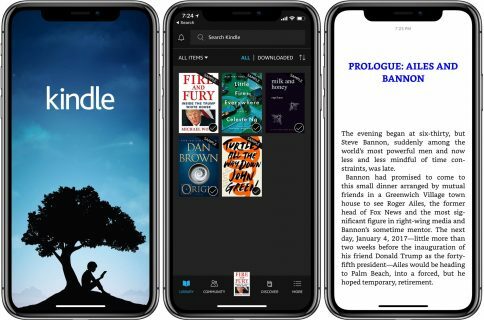 Enter Kindle Direct Publishing, a new self-publishing service aimed at book authors who want to make their warez available through the Amazon ecosystem. 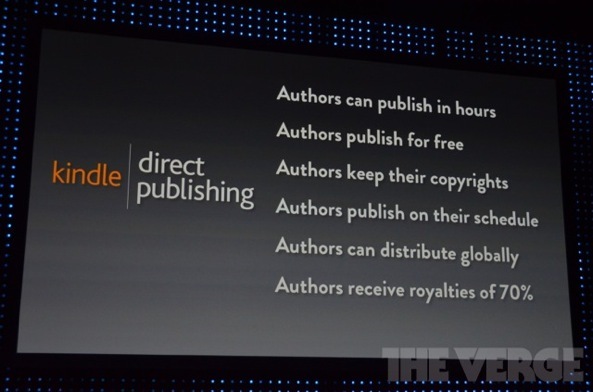 It mimics Apple’s deal for books publishers in that it offers the same 70:30 cut, but creators using Amazon’s service get to keep their copyrights, there is no strict approval process like with the iBookstore and can publish for free. If you ever thought about publishing a book, a manual or anything in written form, this service will help you reach Amazon’s worldwide audience in no time without ever hearing that dreaded line “we can’t take a chance on an unknown author”. 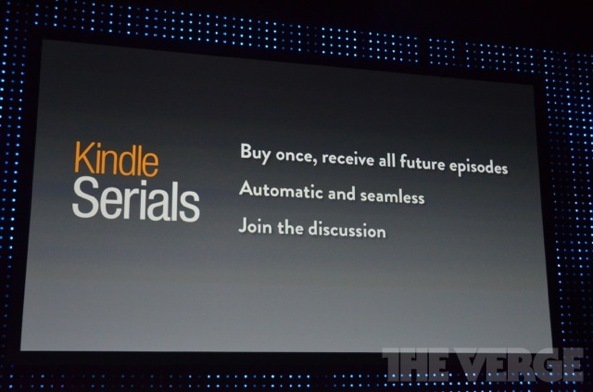 Adamant to redefine the forms of written expression, Amazon previously announced something called Kindle Singles. “There’s a funny thing about physical media. 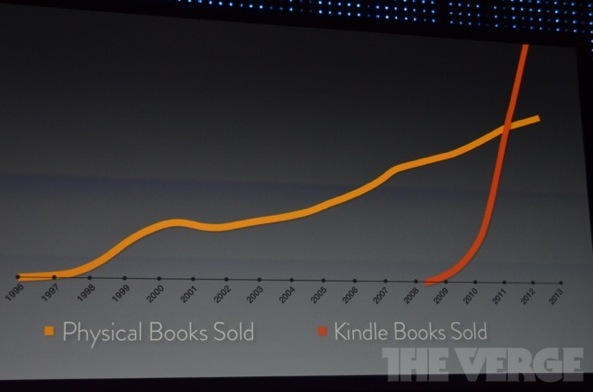 Short things work — they’re called magazine articles — and long things work – they’re called books”, Bezos explained. 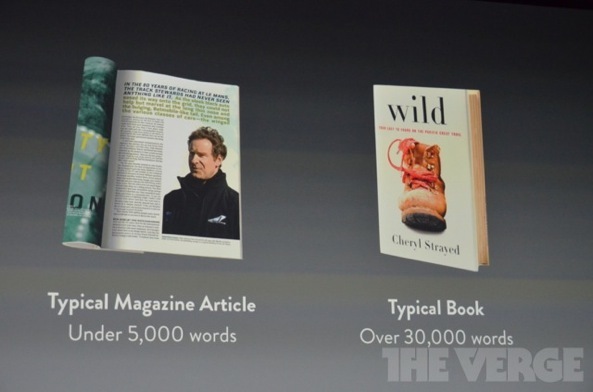 Kindle Singles fit somewhere in between a magazine article (usually under 5,000 words) and a book (typically over 30,000 words). They already sold over 3.5 million Kindle Singles, with 35 hitting the Kindle top 50 charts. There’s also something called Kindle Serials, a Kindle Serials subscription of sorts where you pay once to get all the installments in a certain series, with new issues automatically appended to the back of your current issues. And all Kindle Singles cost just two bucks a pop for all their installments. And what happens when you build a great service? According to this chart, people read more. 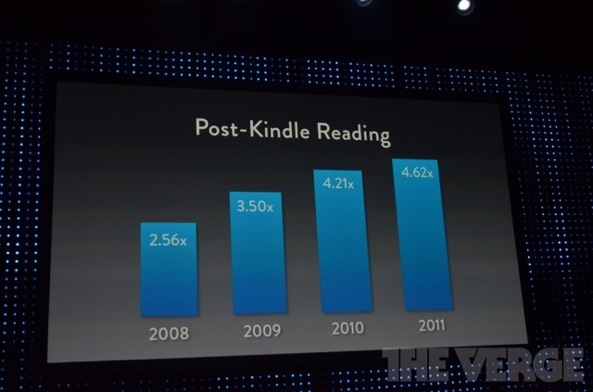 Wasn’t it Steve Jobs who once dissed the original Kindle because “people don’t read anymore”? Now, onto the Kindle Fire, the #1 best-selling item on Amazon.com and 22 percent of tablet sales in the United States, according to Bezos. This holiday season, Amazon is refreshing the Fire by adding twice the RAM and a new CPU for a forty percent faster performance, plus some longer-lasting battery. It’s gonna run you $159, if you can wait until September 14 when the new Fire is scheduled to start shipping to customers. And now for the big thing: the Kindle Fire HD, Amazon’s new 8.9-inch tablet obviously designed to take on Apple’s new iPad. Like the iPad, the Fire HD utilizes in-plane switching (IPS), a premium display technology for wide viewing angles. What’s best, this thing rocks full HD resolution at 1,920-by-1,200 pixel resolution and 254 pixels-per-inch for some crisp text and continuous lines without jagged edges. It’s said to reproduce full spectrum color at all angles thanks to advanced true wide polarizing filter. 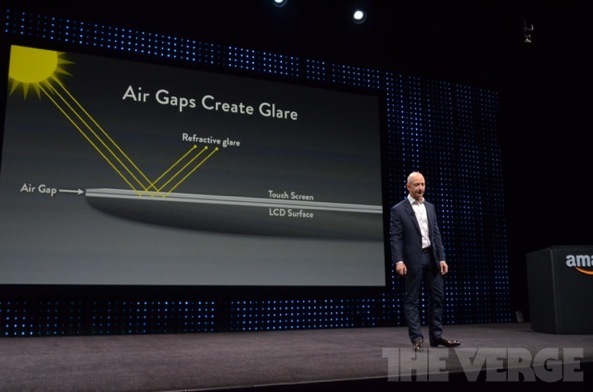 It’s got an anti-glare coating because Amazon’s engineers laminated the touch insert on top of the display, eliminating the air gaps that create reflections. 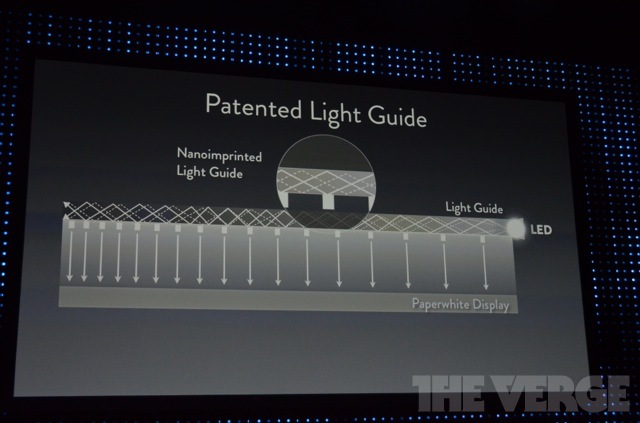 The resulting display has 25 percent less glare. This sounds a lot like in-cell display technology said to be part of the next iPhone. Despite its powerful innards, the Kindle Fire HD is only 8.8mm thick (iPad 3 is 9.4mm), and weighs in at 20 ounces, or 567 grams (iPad 3 is 652 grams for the WiFi-only version and 662 grams for the WiFi + Cellular variant). In order to drive the demanding full HD content, especially games, the Kindle Fire HD taps Texas Instruments’ OMAP 4470 processor that Bezos said is 40 percent smaller than Nvidia’s Tegra 3 silicon found inside Google’s Nexus 7 thing. I guess we’ll see about that when we run both tablets through their paces, though there’s no reason not to take Bezos’s word for it. 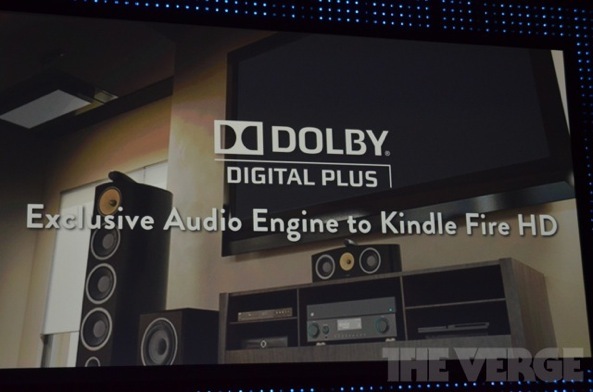 On the sound front, Amazon’s engineers have really gone all out: the Kindle Fire HD exclusively features Dolby Digital Plus audio technology which really pushes the tablet’s dual stereo speakers to their limits. 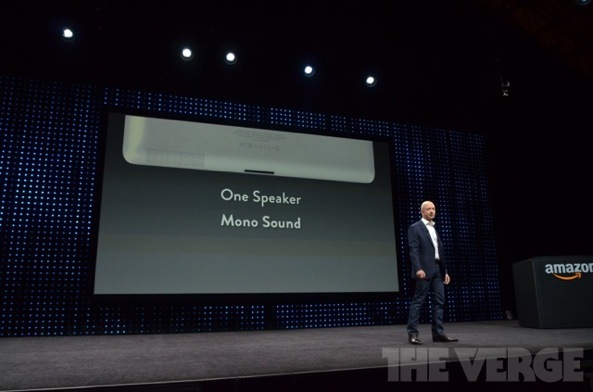 Bezos even dissed the iPad for its single-speaker mono sound. On the networking front, the device features dual-band (2.4/5GHz) WiFi networking and two antennas so the software can choose one experiencing less fading for better reception. It also contributes to a better user experience as your hand will hardly obstruct radio signals. In other words, you can’t hold this tablet the wrong way. And because the Fire HD runs a speedy chip, it can decipher echoes when radio waves get reflected off the surface of real-world objects, which helps the device better understand the communication. They call it FIFO and the Fire HD is the first tablet to employ it. FIFO – add it to your list of nice buzzwords. Here’s your WiFi-related cheat sheet. All told, WiFi on this thing is allegedly 41 percent faster than on the third-generation iPad and 54 percent faster compared to Google’s seven-incher. It also comes with a cool hundred thousand audiobooks from Audible. Thanks to a new Whispersync for voice technology, you can now synchronize your Kindle book and its audiobook counterpart to seamlessly switch between reading and listening. It’s called bimodal reading and it’s useful for everyone, particularly for people who have difficulty reading as it improves retention and understanding. 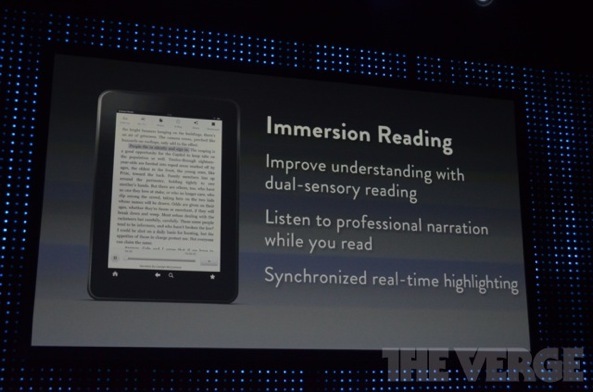 In Amazon’s terminology, it’s called Immersion Reading. When you’re watching a movie, you can tap the character on the screen to get all the relevant information about the actor, courtesy of IMDB, an Amazon property. Turns out there’s a buzzword for that, too – X-Ray for Movies (you can add movies to your Watchlist from X-Ray). 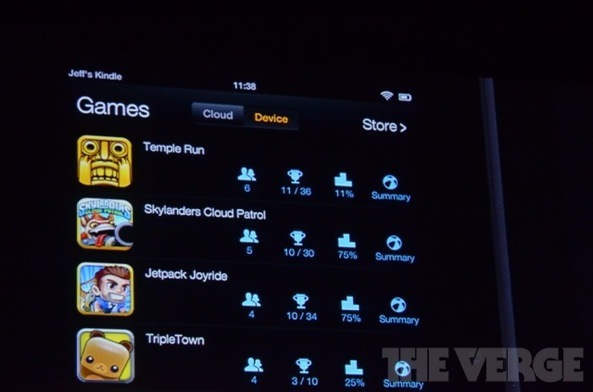 Finally, recognizing that games are the highest-grossing category in any app store, Bezos proudly announced Whispersync for Games, a cloud service that keeps all your unlocked levels and in-game progress stored and synchronized across all your devices via the Amazon cloud. Other software features include an improved email client with “world-class Exchange support”, contacts and calendars syncing, support for Yahoo!, Gmail, Hotmail and more. And in case you’ve been wondering: yes, the Kindle Fire HD comes preloaded with a custom Facebook app that lets you import photos, share book highlights, connect with gamer friends and more. As the Fire HD features a high-definition camera out the front, Amazon also included the Skype app for video calling. Parents can set time limits (another buzzword: Kindle FreeTime) to control on a per-kid basis how much time their children spend with the tablet playing games, reading e-books, watching videos and using apps. 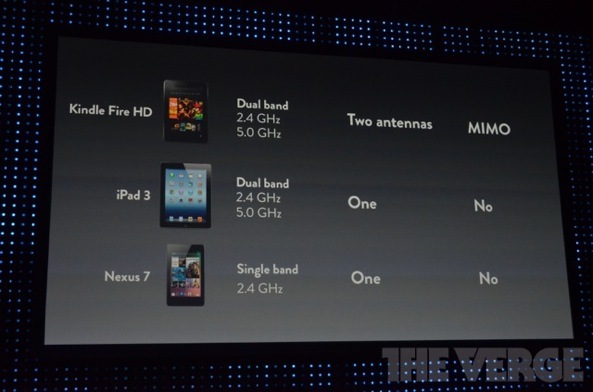 Yeah, the Fire HD is a multi-user device with multiple profiles (we’re looking at you, Apple!). With Bluetooth and HD out completing the long list of features, the Kindle Fire HD looks like a tablet a lot of people may want to put on their holiday shopping list. 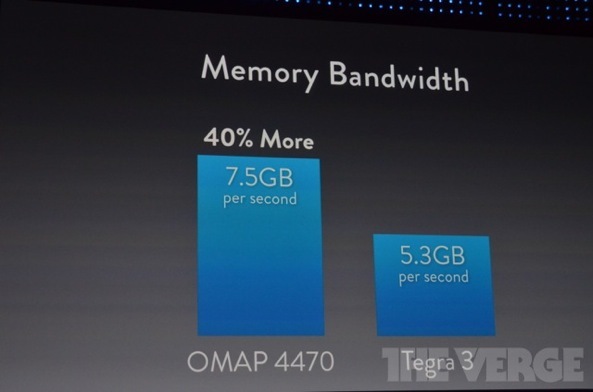 The device comes in two flavors: seven and 8.9 inched, each with sixteen gigabytes of built-in flash storage. The 16GB seven-inch Fire HD is just $199 and I’m certain the price point will give Google a pause as the 16GB Nexus 7 is $249. It’s gonna ship on September 14 and Amazon is taking pre-orders now. 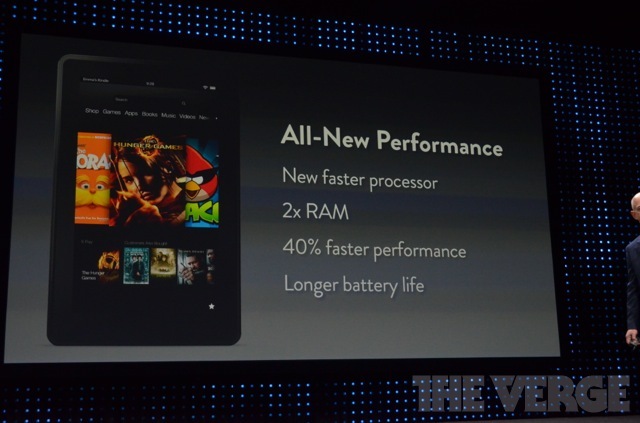 The 8.9-inch Kindle Fire HD will run you down $299 and is set to ship beginning November 20. If you want the 8.9-inch Kindle Fire HD with 4G LTE and 32GB of storage, be prepared to shell out $499 (ships November 20), enough to buy you the entry-level iPad 3 with 16GB of storage. The Kindle Fire HD with 4G LTE offering includes a new data plan: 250MB of free data per month, 20GB of cloud storage and an Amazon Appstore gift card worth ten bucks for just fifty bucks a year (not a month, a year). 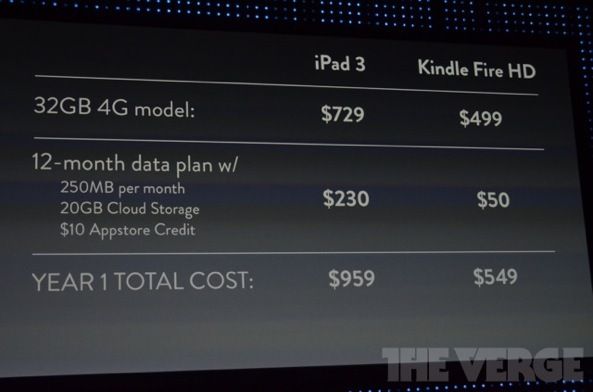 This makes Amazon’s tablet much more easier on your wallet when it comes to cost of ownership, as Bezos demonstrated by putting up this slide. Amazon is presumably loosing money on each hardware sale with the hope of making up with later content sales. 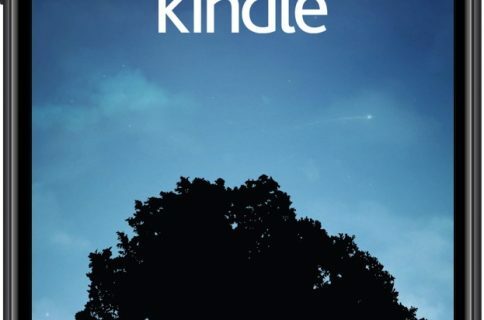 On a final note – and this may surprise a few people out there – all Kindles now come with Amazon’s Special Offers lock screen ads, per The Verge. And with that in mind, I’m wrapping up this coverage. Honestly, I’m seriously impressed with how Amazon has re-imagined itself as a device maker capable of producing more than competitive answers to devices from the likes of Apple and Google. Amazon is also vertically integrated, though not to the extent of Apple, and its ecosystem with low-priced items is as tempting as Apple’s and Google’s, if not more. Eager to learn more about today’s devices? 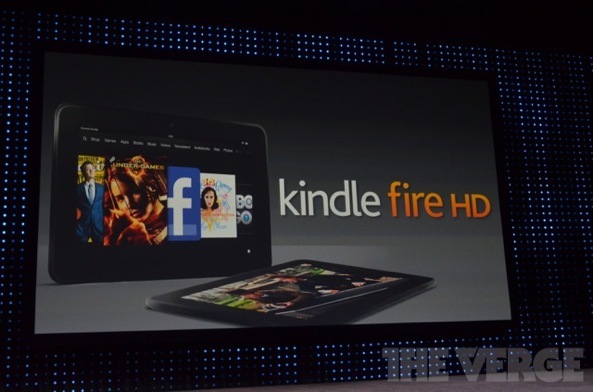 Check out Amazon’s press releases announcing the Kindle Paperwhite and the Kindle Fire HD. If you’re wondering what the heck Amazon coverage is doing on an iOS-focused blog, consider this: Amazon has a world-class ecosystem, they now have a compelling lineup of devices covering a wide range of prices and their game plan is just as good as Apple’s and Google’s. 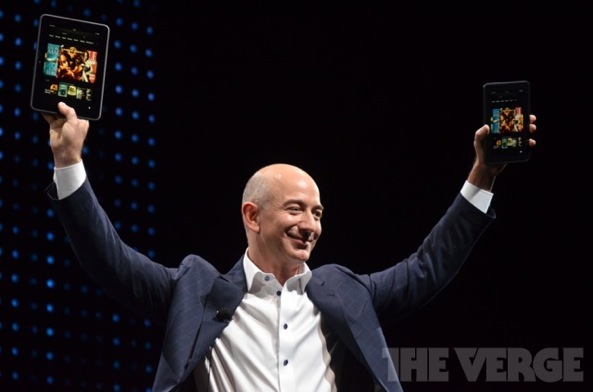 It’s fair to say that Amazon will become Apple’s biggest threat in the tablet space. As for me, I so want a brand spanking new Kindle Paperwhite and one of those Fire HD things under the Christmas tree. Did Amazon’s announcements knock your socks off? Tell us down in the comments.